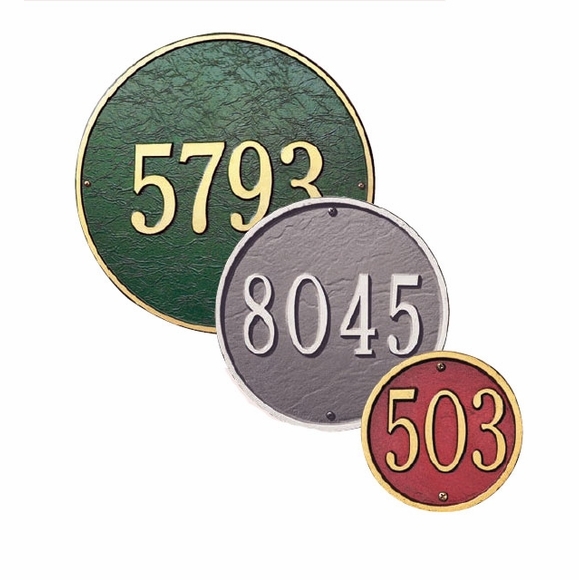 Personalized Round House Number Sign - - one-line round address plaque comes in three sizes: 6" diameter, 9" diameter, and extra large 15" diameter. Made in the USA by Whitehall Products. The 6" diameter plaque holds up to three 3" numbers. The 9" diameter plaque holds up to five 3" numbers. The 15" diameter plaque holds up to three 7" numbers or five 4.5" numbers. In addition, the 15" circle sign is available as either a wall sign or lawn sign. Lawn mount option includes two 18" lawn stakes for convenient set up. Made in USA. It's easy to add curb appeal and dress up your front porch with a personalized address plaque. I love this classic style round 6 inch house number which I got Black w/ Gold. I have mine on a brick front. I just love it. I already have others wanting one for their home too. The quality is great. Came packaged on a hard card board which was showing off the care of shipping. Comes w screws also. I will use this company again.